If your child has recently been diagnosed with autism, as my son was in 2003, here's what I want you to know: Learn from me, don't be me. When professionals first started suggesting that my Leo might be autistic, I reeled. I didn't know anything about autism at the time, except as disability version of a child-stealing bogeyman. When my son's diagnosis was confirmed, I was terrified. And then I was depressed. And then I got to work on figuring out how to parent an autistic kid. And then I made a lot of mistakes. And then I rued those mistakes and tried to do better. And then I wished it hadn't taken me so damn long to figure out the best ways to support, help, advocate for, and express my love for my now-teen son—who has always deserved better than a reeling, terrified, depressed, confused, and regretful mom. 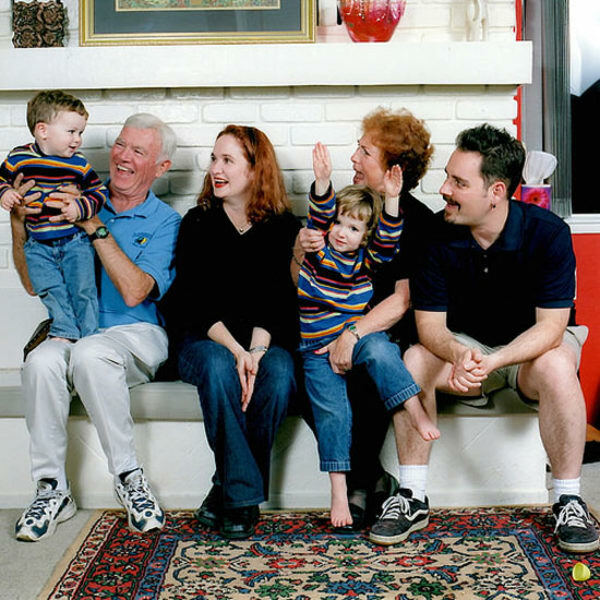 I recently came across a happy photo of my family and my parents, taken around the time Leo was first diagnosed. Leo was obviously such a cute, sweet little guy, radiating and reciprocating joy! Yet that sweetness and that joy was not my focus at the time, because I was so preoccupied by negative assumptions about autism, and also by the urging I was getting from so many sources to "fix" Leo, to hurry up and get him into various therapies so he wouldn't miss any supposed windows of opportunity. I wish I'd known then what I know now: that I should have given myself more time to recognize my wonderful autistic boy for who he is, rather than what people assumed autism made him. I also wish I'd been able to recognize and dismiss all that debilitating ignorance, fear, and confusion. Ideally, I'd go back in time and advise (and pinch) my former self. But since that's not currently possible, my next best option is to share some hard-earned wisdom with parents who are just starting out, so they can avoid some of the mistakes I made, and do right by their autistic kids. So here it is: the advice I wished I'd been given, when my son Leo was first diagnosed with autism. 1. Give yourself time to adjust. Negative messages and images dominate media coverage of autism, and are the main reasons autism tends to scare the crap out of parents and parents-to-be. What most of these people don't realize is that they'll be parenting the same kid they were parenting before the autism diagnosis arrived, and that diagnosis just helps steer you and your parenting approach, in the right direction. So give yourself time to be cautious and thoughtful, and adjust your course as needed. There's no denying that autism can bring challenges for your kid or your family, no matter your child's personality or specific needs. But please know that most problems you encounter will be due to lack of understanding and accommodation about autism from other people and society in general, and not because of autism. This is especially true when your child's needs are less evident: if they don't appear to have a language delay, or if they need support with filtering overwhelming everyday environments, as in processing delays or sensory sensitivities. You also need to give yourself time to understand why those nasty and ever-present cultural messages about all autistic kids being lost in their own worlds, being isolated, lacking affection or empathy, etc., are so hurtful and mistaken, so you can push back against them. Those messages are based on misunderstanding of autistic people and how they interact with and perceive the world, and are just not true. By pushing back, you can help make the world a better place for your child right now, and also for the adult they will become. 2. Give the people around you time to adjust, and keep them in the loop. Like me, my friends and family didn't know a thing about autism when Leo was first diagnosed. They also didn't know what to say to us, beyond platitudes. I don't really blame them; we were all in that ignorance boat together. But I do wish I'd been together enough to feed them lines like, "it's okay to ask us questions, but we might not know the answers yet," and "feel free to keep inviting us over; we'll say no if it doesn't work." One way you can help your people become your team—and by helping them, help your child and yourself—is by inviting folks along for the ride. You can post status updates on private groups on Facebook, on blogs, or though periodic group emails (being mindful of your child's privacy in the more public areas). You can let your people know it's okay to absorb information without commenting. This way, you have less to explain when you see them in person, and the new information you're figuring out won't be foreign to them. 3. Give yourself time to process information critically. There is so much bad autism information out there, especially the hawking of sciencey-sounding "cures" (there's no such thing) or "recovery" (ditto). But there's so much good information, too! And the more informed you become, the more your perspectives on and understanding of autism and parenting will change -- ideally for the better. Wired journalist Steve Silberman's book NeuroTribes*, for example, goes deep into the history of how we define autism, how who qualifies as autistic has changed over time, why there's no autism epidemic, the horrifying origins of Applied Behavioral Analysis, and the emerging leadership of autistic people themselves—and has changed the way a lot of people think about autism. It's a must-read. While I'm not a huge fan of "mommy instinct," I do think parents need to pay attention to their autism information spidey sense. If someone is pushing autism information that does not stand up to even the most cursory research—for instance, that autism is caused by misaligned energy pathways, or is a vaccine injury—run away and find better information resources. 4. Give yourself time learn which organizations and people to trust. Most people outside the communities consider Autism Speaks a trustworthy autism resource. Yet, in my experience, autistic people and their supporters tend to criticize Autism Speaks, for not including any autistic people in its leadership, and for basing their fundraising campaigns on fear of autism and pity for autistic people and their families. Autistic-led organizations like The Autistic Self-Advocacy Network (ASAN) tend to focus on the needs of autistic people of all ages and abilities, and provide toolkits and other advocacy materials. When I'm looking for good information, I tend to watch what ASAN and their allied organizations are posting about. My biggest shift in understanding happened when I encountered autistic people and their writings, and learned to trust them. Julia Bascom's essay Dear Autism Parents felt scary and confrontational when I first read it several years ago, but now sounds impassioned and reasonable—as well as a wake-up call to parents who misunderstand autistic adults, their passion for helping today's autistic kids, and their right to assert authority in understanding the autistic experience. While evaluating whether an org or person is reliable, you may need to work on your own defensiveness. If you get angry at a person's autism information or an autism org's position, consider that you may actually be overwhelmed by the possibility that you had been getting your information from unreliable sources. Give yourself the space to walk away and think things over. You also need to learn to differentiate between those who are legitimately angry over unfair treatment, and those who attack unfairly; you should at least listen respectfully to the former. And, for the sake of all that is holy, avoid toxic parenting groups—meaning parents who at first glance appear reasonable and compassionate, but would "understand" if you hurt your autistic child. 5. Give yourself time to figure out what autism means for your child. Autistic brains and thinking processes can be very different from non-autistic brains. If you're not autistic yourself, learning to recognize and understand these differences may take time, as well as trial and error. What a non-autistic person might think is emotional manipulation or callousness may be logic, executive function challenges, or genuine confusion: An autistic child may refuse to clean their room not out of defiance, but because they can't comprehend taking on large multi-step processes without a checklist; or a child may laugh when other people are in trouble, not to be callous, but out of relief that they or their loved ones aren't the distressed party. Autistic perceptions of pain can also be atypical—some autistic people are hyposensitive, others are hypersensitive, some are both, and some just have a hard time interpreting pain signals. Be vigilant when your child appears to be injured, because they may not be able to tell you just how hurt they are, even if they are otherwise articulate. Sensory experiences are also different for many autistic kids. They may not be able to filter out lights, sounds, or touch—to the point where just walking into a grocery store can cause a meltdown. If your child refuses to enter large, bright, loud, or bustling environments, consider that it may actually be painful for them to do so. If they're not doing well in their classroom, consider that they might need noise-canceling headphones, or tinted glasses, to help filter out sensory stimuli so they can focus. A large percentage of autistic people have clinical-level anxiety, and may learn to self-soothe through stimming or creating elaborate, predictable, and therefore safe, routines. Try to understand why your child may be behaving differently than their peers, instead of getting embarrassed by your child behaving differently than their peers. Also: Become educated about autistic learning styles. Not all autistic kids are math prodigies. In fact, studies show that most don't have superior math skills, but rather average or below-average math skills. In addition, co-occuring learning disabilities like ADHD, dyslexia, or dyscalculia are quite common too, and can be overlooked or termed "laziness" if your child is perceived to have academic strengths in other areas, or if your child is a person of color. 6. Give yourself time to figure out what communication looks like for your child. Everyone communicates. Even kids who don't speak. But autistic kids who can speak fluidly may not be able to communicate all their intentions. Be very careful about this, as those seemingly fluid talkers often have their communication needs underestimated, and suffer as a result. "...they think the problem was that they treated their child like they were intellectually disabled, and they weren’t. But that’s not the problem. The problem is that they thought their child was intellectually disabled, and so they didn’t treat them like a person." Your communication goals for your child should be to find their optimal communication strategy and style—whether that's speaking, using a symbol-to-speech device, or typing—and not to prove to the world that there's a hidden child locked away inside your actual child right there in front of you. 7. Give yourself time to figure out which supports, schools, therapies, and environments will help your child succeed. Is an inclusive educational environment a possibility? Do you know how to differentiate between helpful and harmful therapies? Are you unknowingly subjecting your child to therapies that would never be allowed with non-disabled kids? Do you know how to write educational goals that will best serve your child's needs? 8. Give yourself the space to be flexible about needs, and pick your battles. You may need to adjust your rhythms to those of a kid who doesn't sleep much, whose limited diet means bringing their food along whenever you don't eat at home, who thrives on medications you'd previously consider terrifying choices, who suddenly can't tolerate certain environments and needs to leave. Remind yourself that your child isn't doing any of those things by choice, and renew your commitment to understanding their autistic needs. 9. Give yourself time to find autistic role models for your child. If your child doesn't know any other autistic kids or people like themselves, they may feel alone and isolated (or even broken, or defective). Don't let that happen if you can do anything about it. I have found good role models for my son in the blogs of autistic people, and in books about autistic people. And, of course, through hanging out with autistic people! As much as you love your child and accept your child (and as much as those feelings may be reciprocated)—if you're not autistic, then you're not part of the community your child does belong to. So please help your child find their tribe. 10. Give yourself time to think about shared traits. By this, I mean traits you might share with your child, and other family members might share with your child. Even if you yourself don't have enough traits for an autism diagnosis, many parents and siblings get diagnosed with autism themselves after another family member's diagnosis makes them more aware of what autism can mean. This is especially important for female siblings and family members, as autism in girls is different than autism in boys and is often overlooked due to gender bias in diagnostic criteria. Having multiple people with autistic traits in a home can mean greater understanding, but it can also conflict: In our house, we have some people who like to make noise, some people who are rather insensitive to noise, and some people who are overly sensitive to noise. If the noise maker is happy, the noise-avoider is miserable, and the noise-oblivious person (okay, me) is too often wondering what the hell is going on. We are still learning to negotiate our space to suit everyone's sensory needs. 11. Give your child space to grow and change. Not just when puberty hits (boy howdy, this is where we are now, and it can be different for autistic kids—it can really scramble communication abilities, emotional stability, and coping capabilities), but in terms of autistic development being different than non-autistic development. I worry a lot about people whose families stop trying to teaching their kids skills because they're past some imaginary development window, when autistic people actually tend to continue to gain skills throughout their lifetimes, more so than non-autistic people. 12. Give yourself time to figure out what your child really enjoys. Surrender to that joy whenever possible. Your kid is a kid, after all. Don't let people frame your kid's enthusiasms in pathological terms like "special interest" or "splinter skill." If your kid likes something, and they're not hurting anyone, let them like liking it. 13. Give yourself time to plan for your child's future without you. For kids who do not have certain health conditions, there's no reason to think your child won't outlive you. And that's how you need to plan for their future—as one without you in it. Denial helps no one here, and could actually really imperil your child. So start figuring this out now, and then you'll have one less thing to worry about. I realize this is a lot (a lot!) of information to digest. Give yourself time to think it all over. If I just made you feel like you stepped into autism parenting information quicksand, come back later, or try to portion it out and think over various bits of advice as needed. Know that, even though I've been writing about parenting and autism since 2003, I honestly learn something new every day. I know I haven't learned nearly enough yet—but I also know that my son and I both benefit whenever I learn something helpful. So keep on learning and loving, and let me know if I can ever help. Note that I could put in a link for every assertion I made above, but then this would look even more like a research paper. If you want background on any unlinked topic, just ask. Please also know that this is a brief overview, and that I could write a separate essay on each point above. Disclosure: Our family was consulted in the writing of NeuroTribes.